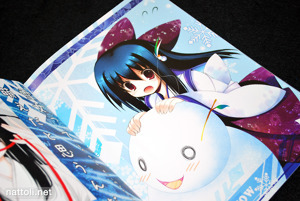 nattoli.net > Nattoli's blog > Comiket 77 & Tenmu Shinryuusai - Tenmu Shinryuusai's Kurokami Shoujo... Hon! Tenmu Shinryuusai's Kurokami Shoujo... Hon! 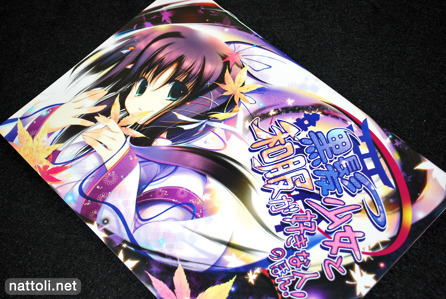 The artist with a long name has opted for an even longer title on his C77 full color illustration doujinshi release, Kurokami Shoujo to Wafuku ga Suki na Hito no Hon! (黒髪少女と和服が好きな人のほん!) which is still in stock months after the event on Toranoana ^^ This wasn't really a stand out doujinshi for me, but I was reminded of it when I noticed Tenmu Shinryuusai's new COMIC1☆4 release. Kurokami Shoujo... Hon! 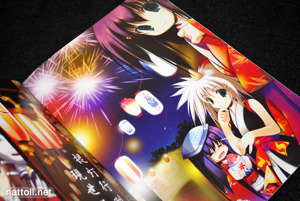 is a B5 sized, staple-bound doujinshi that feels strangely shorter than it actually is---20 pages including the covers. 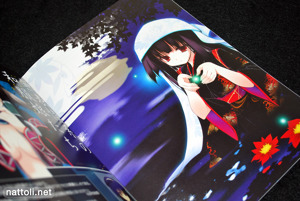 I guess that would be because, like with Tenmu Shinryuusai's previous doujinshi releases, there is a lot of text over the illustrations, making it feel more like a magazine than an illustration doujinshi. Even still, the illustrations are vibrant and colorful, just not plentiful ^^; Outside of E☆2 (Etsu) magazine (and as a result, the Girls Girls Girls! art book series) I don't see a lot of commercial work from Tenmu Shinryuusai, so following his doujinshi is a must for keeping tabs on this artist. 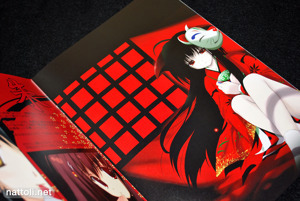 And as always, plenty of miko illustrations in this volume as well. Also included on the last couple of pages is one illustration that has become a figure, and another with the potential to be one (with various angle views and all). You can see photos of the completed figure on moeyo.com. Title: Kurokami Shoujo to Wafuku ga Suki na Hito no Hon! Skip the artbook, go straight for the figure!!! 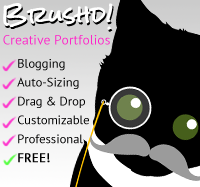 Thanks for the sharing ! Colors are awesome ! 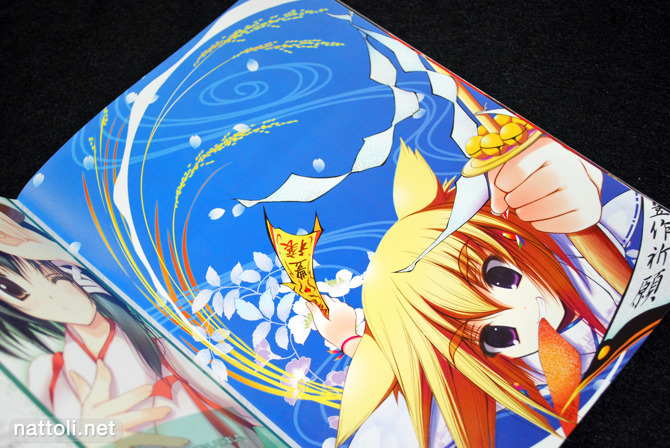 Tenmu Shinryuusai certainly gained place of Miko artist per excellence. Thanks for the write-up! Makes me wanna check out some Nagomi goodness at last as well (up to now merely sticking to this artist's contribution for Taiwan Midori project and his E☆2 work/column serialized together with Kantoku now). Honestly I like the art presentation, while not untouched/clear the inclusion of writing at some adds a bit of a magazine/fanzine touch to it IMO which is something rare/unique. Also thanks for the figure link..didn't notice they were making a figure based on this illustrator's designs though the result doesn't impress me at all (doesn't capture any of Tenmu's distinctive art elements and looks more like your standard Bishoujo figure instead if you ask me). Also to answer the question raised I did my Comic1 shopping (how could I resist the new wave of publications? ^^) Smaller/bigger events, I'd say Comic1 despite it being still a fresh event already became a big scale one compared to some others (SunCre, ComiTre, Comitia) with a much longer history...since it had support/back-up by Doujin scene from the very start on.